Print Green | Commerce Printing Services, Inc.
reduce. reuse. recycle. Today matters in the way you care for the world we live in. It sets an example of environmental leadership and responsibility — not just at home, but around the world. 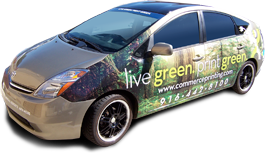 Our mission at Commerce Printing is to live green, print green. From soy based inks to 100% recycled paper to biodiesel technology, we strive to set an example today. We use only non-toxic vegetable based inks. Our inks are far more environmentally friendly to produce than traditional inks, and are biodegradable, making it easier to recycle printed materials. For our clients added benefit, they are even brighter and more vibrant than traditional inks, making your product that much more attractive. We partnered with Performance Chevrolet and InterState Oil Company to implement the use of new biodiesel vans in our fleet, using a non-toxic, low–emissions fuel derived from renewable resources. All of our paper trimmings are collected and recycled, and we have also implemented a similar system to gather plastics, to ensure that nothing is wasted. We hate to see anything go into the dumpster. Always committed to reducing our impact on the environment, we are a Forest Stewardship Council® Supplier. Only with FSC® can you be assured your paper has been harvested in a way that respects the rights of indigenous peoples, prohibits conversion of natural forests, prohibits use of hazardous pesticides and prohibits the cultivation of genetically modified trees. In addition we are annually audited to ensure complete compliance with their extensive procedures. Please contact us about FSC® availability. As a leader in the industry, we understand our obligation to be environmentally responsible. We remain committed to finding new ways to reduce our dependence on fossil fuels and promote the responsible management of our resources. One example is our fleet of hybrid cars, which combine the clean energy of an electric motor with the power of a gas-powered engine, resulting in low emissions and higher gas mileage. We pride ourselves on being environmentally progressive, and we would like to hear your thoughts on the subject. If you have any questions or suggestions to make Commerce Printing any greener, call or e-mail us.